City of southern Italy. It was one of the oldest seats of Jewish learning in Europe, so that at an early date the proverb "From Bari shall the Law go forth, and the word of the Lord from Otranto" came into circulation. In the Middle Ages the community was a comparatively large one. Benjamin of Tudela, who speaks of the town as being "on the coast of the Grecian Sea," found there about 500 Jews, leaders among whom were Rabbis Menahem, Caleb, Meïr, and Mali. The community survived until about 1540 the various vicissitudes experienced by all Jews in the kingdom of Naples. As late as 1538 mention is made of regular sermons preached in Otranto; and at about the same time a divorce document was drawn up there. The following scholars are known to have lived at Otranto: Moses b. Shem-Ṭob ibn Ḥabib of Lisbon (15th cent.) and the liturgical poet Menahem b. Mordecai Corisi ( ). 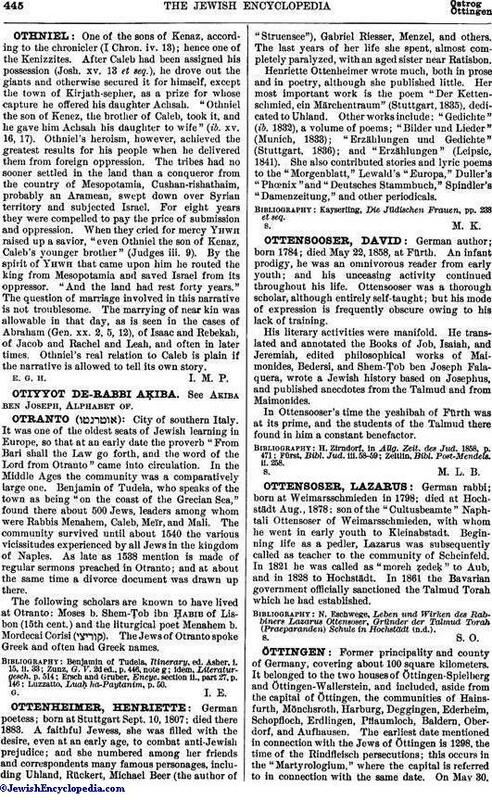 The Jews of Otranto spoke Greek and often had Greek names. Luzzatto, Luaḥ ha-Paytanim, p. 50.